Incorporated Name: Arby's Restaurant Group, Inc.
You get the strength of a brand with a 45-year history of doing things different and better. You get unparalleled marketing, franchising, and operational support. And best of all, you get to join one of the most loyal franchise families in the restaurant business, a group of go-getters who want you to succeed and will do whatever it takes to help get you there. Sound like a place you can call home? 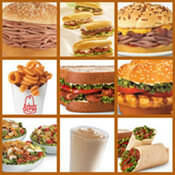 We think you'll agree that Arby's is your place. The opportunity to join an established and profitable, yet growing brand is here. When you become part of the Arby's family, you'll have access to an innovative product line, prime restaurant sites, open development markets, and a brand culture that believes in something different and better for our customers, vendors, employees, and franchisees. The initial license fee for an Arby's restaurant is $37,500 for the first franchise unit and $25,000 for each subsequent unit. Advertising - 1.2% of gross sales for participation in our franchisee-owned marketing association and national advertising; at least 3% of gross sales for local store marketing. We are searching for multi-unit foodservice and retail operators, as well as other investors who have a history of business success. Other franchise candidates are also encouraged to apply, but will be required to have either experienced, qualified restaurant operators as part of their teams, or must complete our extensive training program. Please note this franchise is not accepting inquiries from outside the United States. Interested parties should have at least $500,000 to invest. 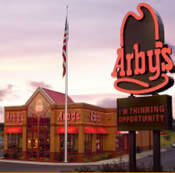 Arby's is currently accepting inquiries from the following states: Wyoming, West Virginia, Wisconsin, Washington, Vermont, Virginia, Utah, Texas, Tennessee, South Dakota, South Carolina, Rhode Island, Pennsylvania, Oregon, Oklahoma, Ohio, New York, Nevada, New Mexico, New Jersey, New Hampshire, Nebraska, North Dakota, North Carolina, Montana, Mississippi, Missouri, Minnesota, Michigan, Maine, Maryland, Massachusetts, Louisiana, Kentucky, Kansas, Indiana, Illinois, Idaho, Iowa, Hawaii, Georgia, Florida, Delaware, Washington, D.C., Connecticut, Colorado, California, Arizona, Arkansas, Alabama, Alaska. Arby's is also currently accepting inquiries from Canada.